Talbott was recognized as an outstanding local businesses that demostrates exceptional marketing success and service to customers and our Davis community. Talbott was recognized for its creativity and finesses in radiant design, as well as for exemplary execution in installations. Talbott was recognized for outstanding community service, and steadfast commitment to customer service and environmental stewardship. Talbott's CEO Dean Newberry speaks about his xLath™ product at the RPA System Showcase. 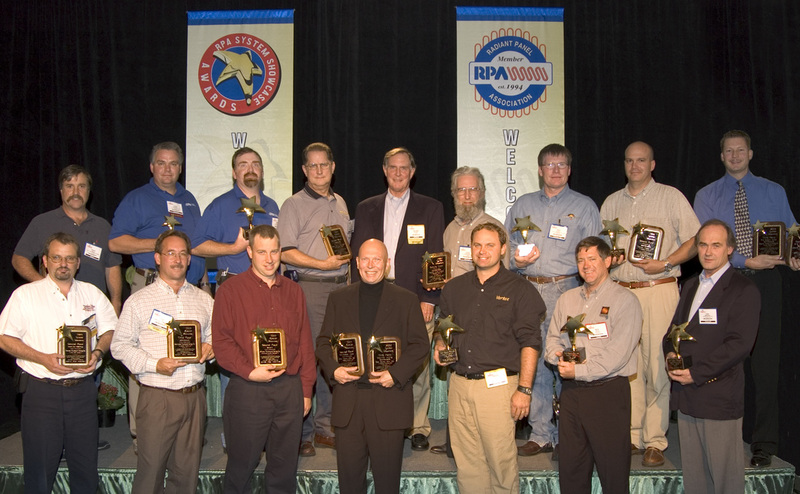 Talbott's CEO, Dean Newberry--4th from the right with his first place award. Radiant Panel Association, System Showcase 2006,8,9 First Place Cooling.